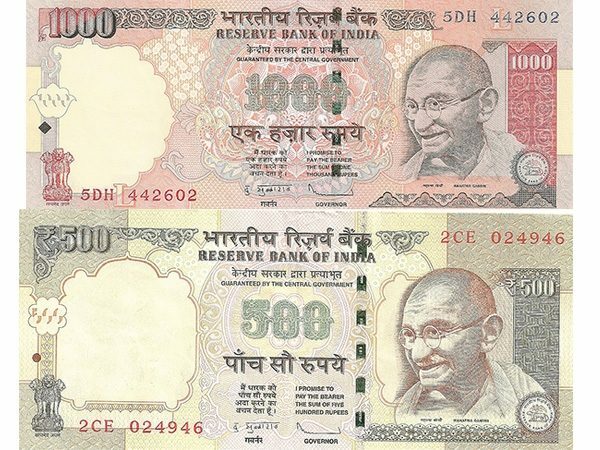 Indian government has announced that the 500 ($7.6) and 1,000 rupee banknotes will be withdrawn from the financial system overnight. The surprise move is part of a crackdown on corruption and illegal cash holdings, PM Narendra Modi said in a nationwide address on TV. “Black money and corruption are the biggest obstacles in eradicating poverty,” he said. New 500 and 2,000 rupee denomination notes will be issued to replace them. Banks have been told to exchange existing high denomination rupee notes over the next 50 days. The move is designed to lock out money that is unaccounted for – known as “black money” – which may have been acquired corruptly, or be being withheld from the tax authorities. India – the seventh largest economy in the world – is overwhelmingly a cash economy, with most of its currency stored in 1,000 and 500 rupee notes. Narendra Modi explained the thinking behind the move in an unscheduled speech on November 8. “On one hand, we are number one in economic growth and on the other we are ranked 100 in global corruption rankings,” he said. It is seen as the boldest move by any Indian government to clampdown on tax evaders. The 500 and 1,000 rupee notes are the highest denomination notes in the country and are extremely common in India. Airports, railway stations and hospitals will only accept them until November 11. People will be able to exchange their money at banks between November 10 and December 30. Narendra Modi’s ruling Bharatiya Janata Party came into power in 2014 promising to bring billions of dollars of black market money into the country’s financial system. His government is half way through its term of office. The announcement comes just over a month after the Indian government raised nearly $10 billion through a tax amnesty for Indians to declare hidden income and assets. Government guidelines say it is possible to exchange 4,000 rupees – but it is not clear if this is per day or in total. Critics say the new rules may make it especially difficult for people who choose to keep their cash at home rather than in a bank account and for people with large rupee cash reserves who live abroad. If there is a legitimate explanation for the cash, the authorities say, it will be possible to exchange it. Cash points will close on November 9 and in some places also on November 10 – a development that it seems may cause cash blockages or queues at ATMs.